World-renown vineyards, craggy mountains, iced-blue lakes, and picturesque towns. With local capital Dunedin as its main urban centre, Otago is a vast southern region that combines the best of New Zealand. Arguably the country’s most diverse and scenic spot, Otago is an unmissable spot. Otago’s and particularly Dunedin’s Scottish feel (“The Edinburg of the South”) is a direct heritage of the first European settlers, a branch of the Free Church of Scotland founded in 1848. This heritage got somewhat diluted –although 80% of the population is still of European/Scottish descent– when gold was discovered in Central Otago while the rush attracted countless fortune-seekers from all around the world. Gold and presbyterianism are therefore the cornerstones of the region. An emphasis on education contributed further to making Otago the wealthiest region in the country at the turn of the 20th century. New Zealand’s first university, the University of Otago, was founded in 1869 as the provincial university in Dunedin. Still active and highly regarded today, it attracts over 20,000 students that make a little under 1/5 of Dunedin’s population. The city is consequently known to be a very young and dynamic cultural centre. The region’s scenery has also been an inspiration to local and overseas artists for decades. 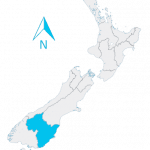 While a over half of Otago’s population resides in Dunedin, the rest is spread across smaller towns such as scenic Queenstown or Wanaka, homes to winter/summer mountain and lake sports, Alexandra, or coastal Oamaru. Otago has two main types of terrain and climate. The West consists of high Alpine mountains and dramatic valleys (cities Queenstown & Wanaka). Further East, vast drylands (tussock grasslands) in the centre (cities Alexandra & Cromwell), extensive coastline in the far East (Dunedin & Oamaru), and the Caitlins, a rough hill country in the South East. Climate varies accordingly with mild coastal weather versus hot/dry summer and cold, frosty winter further inland. As for other New Zealand regions, Otago offers a whole range of outdoor activities, with skiing/ice skating in winter, and water sports and hiking in summer. Otago jobs opportunities mainly include education, farming/wine, and tourism. Dunedin’s university retains a certain prestige for medical curriculums and education jobs lie accordingly. While farming and forestry will see potential for skilled workers, the wine industry is particularly active, the region having gained local and international reputation for its premium Pinot Noirs. Tourism is a major contributor to the economy: Queenstown and Wanaka are not-to-be-missed destinations for adventure-lovers with bungee-jumping/skiing/hiking/water sports operators in every corner and luxury lodges set in some of the most scenic locations in the world. A recent emphasis on conference and incentives is pushing for Queenstown to become a major international conference centre.